1. The issue at hand. 2. What is the cause of the issue? 3. What is the cause of the issue discovered in #2? 4. What is the cause of the issue discovered in #3? 5-11. Continue on in the same manner. 12. What is the cause of the issue discovered in #11? This is the root cause of the issue identified in #1. 13-15. Suggestions and advice to overcome the root problem identified in #12. To use this spread: Shuffle the cards while keeping in mind an issue you want to address. For example, “I don’t have a job.” When you’re ready, lay out the cards face down in the order pictured. Turn over the first card. This card will either give you a more nuanced view of the issue you want to address, or, as tarot often does, will show you the problem that you actually need to focus on. Then, flip the second card. This will identify the reason why your issue exists. If your issue was your lack of employment, this card will explain why that is. Perhaps, “I’m too afraid to put myself out there.” Turn over card #3. This will explain the cause of the issue identified in position #2. “Why am I afraid to put myself out there?” Then turn over card #4 to identify the cause of the issue identified in #3, and so on. Potion #12 will represent the root cause of our original issue. At this point, you can work on addressing the root cause of your problem. Suggestions and advice for overcoming the root cause of your issue can be divined from cards 13-15. These can be read separately (as in a 3-step solution) or together. This is a deeply personal spread and is best done alone, sometimes talking aloud. Keep notes so you can follow your path to your root cause again and again, searching for more nuance. 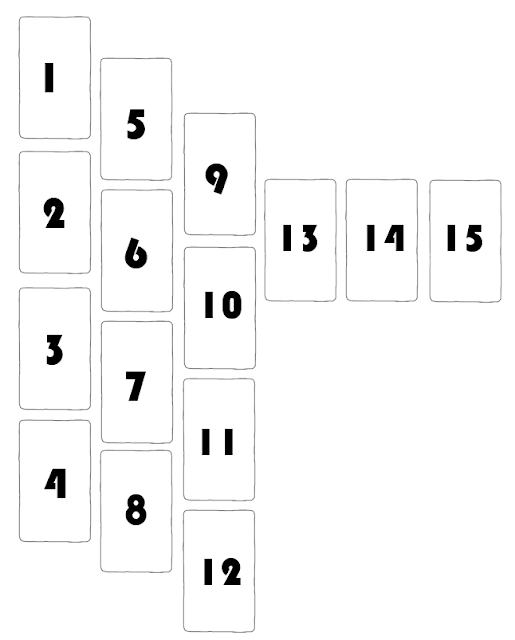 If you feel like your spread leaves you wanting, try using card 12 as card 1, reshuffle the deck and lay cards 2-15 out. Go through the process again until you reach the root cause. This spread is yours to use freely. You are more than welcome to print this post or copy it into your tarot spread collection. If you'd like a PDF version of this spread (which includes the exact same information found on this page) that has been formatted to fit onto one page, you can purchase it on my Etsy shop.